The Canadian province of Prince Edward Island (PEI) held a referendum (“plebiscite”) on electoral reform. The voting, which could be done online or by phone, took place from 27 October to 7 November, Results have now been announced, and the majority preference is mixed-member proportional (MMP). Interestingly, it was a vote among multiple options, conducted by alternative vote (instant runoff). The initial plurality choice was the status quo, first past the post (FPTP). But this was the first choice of only 31.2%. The runner up in first preferences was MMP, with 29%. Through elimination of lower-ranking choices and transfer of preferences, MMP came out with a majority on the fourth round of counting, 55% to 45% over FPTP (leaving out exhausted ballots, which were just under 5%). Other options were “FPTP with leaders” (status quo, except that party leaders who did not win a riding would get a seat if the party cleared 10%), “Preferential Voting” (i.e., alternative vote), and something new called “Dual-Member Proportional“. PEI had a referendum on an official proposal for MMP in 2005, which went down to a big defeat. Since that time, the province has continued to have some of the odd results (e.g. 2007) that are inherent to FPTP, especially given such a small assembly. In the most recent provincial election (2015) there was another large manufactured majority, although the Green Party managed to win a seat despite just 11% of the provincewide vote. The timing of the vote is interesting, given that the federal parliamentary committee studying electoral reform is due to report in just a few weeks. The PEI referendum result is non-binding. Thanks to Wilf Day for the reminder that there is also a provincial election in Prince Edward Island this week–today, in fact. It will be another large manufactured majority, with Liberals currently on 18 seats with a bit over 41% of the votes. Conservatives 7 seats on 37%, and a Green MLA elected (11% province wide). The NDP looks to be shut out in seats, despite currently being just slightly ahead of the Greens in votes. As for the one Green win, in Kellys Cross-Cumberland, it is not close. The Green candidate, Peter Bevan-Baker has 54.8%, and the Liberal trails far behind on 27.6%. I know nothing about Kellys Cross-Cumberland or Bevan-Baker, but I am always intrigued by constituencies where Greens win, given how rare they are. Update: In a comment (#7), I compare the result to the seat-vote equation estimate. Three Canadian provinces have elections this week. Voting has already been completed in Prince Edward Island (PEI) and Manitoba, and is taking place today in Ontario, the largest province. Each elections shows–or is likely to show–the vagaries of FPTP. First, the election in PEI produced a lopsided majority–again. The incumbent Liberal party returned to office with 22 of the 27 seats, on a slightly reduced vote percentage (51.4% compared to 52.9% in 2007). This was a loss of one seat, with the Conservatives winning 5 (+1). For the second straight election, the Greens supplanted the NDP as the (distant) third party, with 4.3% (up from 3%). The province has a history of lopsided results (as I have shown in graphs); the 2003 Liberal victory marked an alternation from a Conservative government, which itself had 23 seats. In the election before that, the Conservatives had 26 of the 27 seats. In 1996, the last time no party won a majority of the vote, the Conservatives, with 47.4% could manage “only” 18 seats (a 2/3 majority). One key reason why PEI has such lopsided results is that its assembly is about half the size that the cube root rule says it “should be,” for its electorate. With around 80,000 voters turning out in recent elections, an assembly of 55 seats would be more appropriate than 27. The undersized assembly is why the seat-vote equation sees as “normal” for FPTP even a a party with just over 50% of the votes potentially getting almost two thirds of the seats. 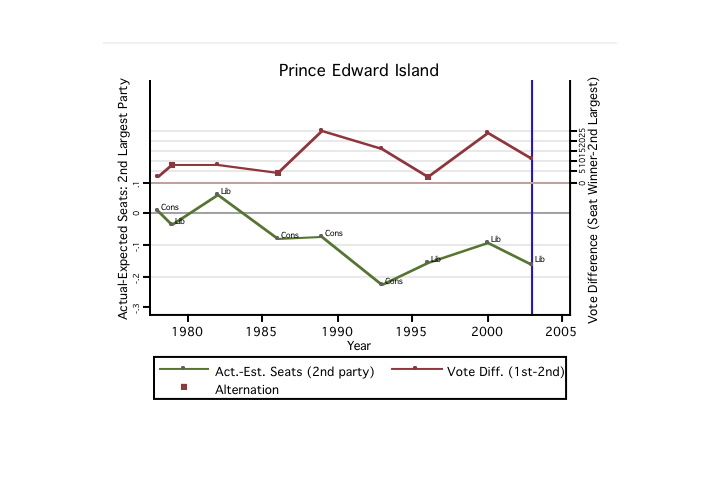 The geographic distribution of the vote in PEI, and its tendency towards big island-wide vote swings, only exacerbate an inherent tendency for big seat bonuses for the largest party. Of course, the Island could also get less distorted results with even a modestly proportional mixed-member system, such as the one resoundingly turned down in a referendum in 2005. In Manitoba‘s election, the incumbent NDP was returned to office with 37 of the 57 seats (64.9%) on just 46% of the votes. The NDP had won 36 seats in 2007 on 48% of the votes. So the party’s votes declined, but it seats increased. The second-place Conservatives substantially increased their votes, from 37.9% to 43.7%, yet saw their seats remain steady on 19. Such are the vagaries of FPTP. Liberals saw their votes fall from 12.4% to 7.5%, and dropped from 2 seats to 1. Manitoba has no record of particularly odd results, although in both 1990 and 1995 the second largest party won many more seats than it “should have” won. This is a pattern that can result in a plurality reversal (higher seat total for the second largest party in votes), if the election is close enough. In both of those elections, the Conservatives won narrow seat majorities on less than 43% of the votes, while the second-place NDP in 1995 had 40% of the seats despite only 33% of the votes. ((In 1990, it had only 28.8% of the votes, yet 35% of the seats.)) Evidently, in several recent elections the NDP’s geographic distribution of its votes has been such that it can translate them into many more seats than expected, whether it is the largest or runner-up party. I point this out simply because this week’s election was quite close in votes (46%-44%) yet produced an unexpectedly large seat bonus for the NDP. A plurality reversal may have been barely more than a couple of percentage points of the provincial vote from happening. In today’s Ontario election, we see real three-party competition, with the third largest party, the NDP, polling at around a quarter of the votes. The incumbent Liberal party won 71 seats in the 2007 election, or 66.4% on just 42.2% of the vote. For most of this year, it was expected to lose, possibly by a wide margin, to the Conservatives. Yet as the official campaign got underway, the Liberals and NDP made gains in polls. For a while the Liberals and Conservatives looked headed for a near tie in seats, with neither winning a majority, and a potential plurality reversal. Now the Liberals could retain a majority of seats, depending on how some key ridings (districts) turn out. Ontario’s three-party competition suggests it would be well served by a proportional system, such as the mixed-member system proposed by a citizens assembly, but turned down in a referendum the same day as the provincial parliamentary election in 2007. Finally, both Manitoba and Ontario, like PEI, have undersized assemblies. For their population sizes, the cube root rule expects around 100 seats in Manitoba (instead of 57) and 200 in Ontario (instead of 107). Small assembly sizes only exacerbate the chances of anomalous results, although if one wanted seats distributions more reflective of votes distributions, a proportional electoral system would do the trick without needing to increase assembly size. Matthew S. Shugart, “Inherent and Contingent Factors in Reform Initiation in Plurality Systems,” in To Keep or Change First Past the Post, ed. By André Blais. Oxford: Oxford University Press, 2008. Past election data and estimates of seats come from the data set originally prepared in conjunction with the chapter, and updated since. Error on year of NDP majority in original entry corrected. In a province with a history of lopsided majorities, Prince Edward Island’s FPTP electoral system has again produced a grossly exaggerated seat bonus for the leading party. The opposition Liberals have defeated the governing Conservatives, 23 seats to 4. That’s a governing party with more than 85% of the seats and an opposition hardly able to function as such. This just so happens to be an exact reversal of the seat balance from the 2003 election. The upper reddish line shows the vote difference over time between the two leading parties. Elections have only sporadically been close in votes (this one was expected to be, but again was not). The lower green-colored line shows the deviation from the expected seat share of the second party (based on the seat-vote equation), with zero deviation represented by the grey horizontal line. That the second party tends to be so under-represented–even relative to the normal expectation for parties with these actual votes ratios and with such a small assembly–shows that today’s result is by no means unusual for the province. Nor does it matter which party is the second party: the effect is systemic. PEI certainly would be a good candidate for reform, but colorful though the Island’s political culture is, reformist it is not. In fact, the voters rejected an independent commission’s proposal for a rather modest form of mixed-member proportional (MMP) system in November, 2005. The proposal to adopt MMP in Prince Edward Island went down to crushing defeat in a very low-turnout referendum on Monday. As I had noted a few days ago, PEI was not a jurisdiction where any form of PR could be expected to sell well. The province lacks the multiparty competition in the electorate that almost always precedes serious movements towards PR; moreover, while colorful, its electoral history is hardly reformist. It does, however, have a history of ridiculously lopsided votes-to-seats conversions, so some form of electoral reform would seem to be a good idea. Whether any other reform discussion will ensue before the next time an opposition party is nearly or totally wiped out of parliament will be something to keep an eye on. The official results, still being counted, show about 36% yes to 64% no. Aproval only in two of Charlottetown’s three ridings. As previously noted, Prince Edward Island will hold its referendum on adopting mixed-member proportional representation for its provincial legislative assembly on Monday, under rules changed late in the game by the premier in order to put roadblocks into a reform path that he himself had initiated. PEI could be the first province to go to a PR system, BC having narrowly missed the chance some months ago. In the provincial general election of May, 2005, 57% of British Columbia voters favored a change of their electoral system from plurality (FPTP) to STV. Only 46% of voters favored the incumbent Liberal government. Yet STV was “defeated” while the Liberals “won” another four-year term as a majority government. The referendum and its anomalous outcome was a result of a previous decision by the Liberal government to set up a Citizens Assembly to consider an alternative way to elect the provincial parliament, but to mandate that the Assembly’s proposal would require a 60% vote (and also majorities in 60% of the provincial ridings, or electoral districts). Similar rules will be in place in PEI. Rather embarrassed by being returned to unchecked power despite being less popular than an electoral system that would have forced them to share power had it already been in effect, the BC Liberals announced that they would allow a second referendum (under the same rules). Norman Specter, in the Globe and Mail, is not too happy about the whole situation–or the referendum on proportional representation Monday in PEI. As he notes, the second BC referendum will be at the same time as the next BC municipal elections, when turnout tends to be low. In fact, based on the turnout in the last provincial election, only about a third of voting-age British Columbians approved STV. And, with the normally lower turnout of voters in municipal elections, an even lower percentage of voters will have the power in 2008 to change the most fundamental rule of our democratic system. Of course, if only a third of voting age British Columbians approved STV, then less than thirty percent approved the current government. That would seem to make STV (or any form of PR) more, not less appropriate, in the sense of preventing full authority being lodged in the hands of a party with such a thin mandate. Looking at that situation, one has to wonder exactly what problem is being addressed. In the last PEI provincial election, 26 of the 27 MLAs were elected with more than 50 per cent of the vote. He has a point. Proportional representation is usually adopted only where three or more parties are splitting the vote, resulting in governments that are clearly majority-opposed rather than (nearly) majority-supported. For the record, the problem electoral reform in PEI seeks to address is super-lopsided parliaments. The PEI Conservatives won 96% of the seats on 57% of the votes in 2000, two elections after the Liberals had won 98% (i.e. all but on seat) on 55%. In between, in 1996, the Conservatives won two thirds of the seats on just 47% of the vote. Reform of some type is clearly needed, though the absence of multipartism in the electorate makes PR a tougher sell. But Specter thinks that FPTP can accommodate three parties fairly well, and points to the last BC election. It was indeed a classic Westminster-style election,with Liberals winning their comfortable majority with 46 (of 79) seats on 46% of the vote, the NDP 13 seats behind despite trailing by only around four percentage points of the vote, and no seats were won by the Greens (9% of the vote) and other parties. While this is an outcome that PR advocates would argue is unrepresentative, it is nonetheless certainly the case that PR would never have come on to the the agenda if all BC elections turned out like 2005. But of course they do not. PR got on the agenda in the first place because of the 1996 BC election in which the NDP won a majority of seats on only 39% of the vote while the Liberals actually had nearly 42% of the vote. Then in 2001 BC had an election like the two mentioned above in PEI, when the Liberals won all but three seats on 57% of the vote. That’s why nearly 58% of voters wanted a new electoral system, even if the rules were set up to make that insufficient.